means they are likely to require support under the NDIS for a lifetime. There are different eligibility processes depending on factors such as whether a person is already currently receiving disability funding. How can I find out if the person I care for is eligible for the NDIS? To find out the person you care for is eligible for NDIS funding, you can use an online tool called the NDIS Access Checklist. This tool asks questions that can help you to work out if someone is eligible for NDIS support. 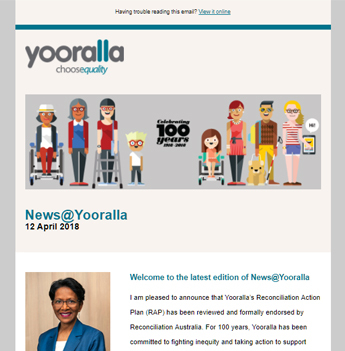 Yooralla has also developed a free guide to accessing the NDIS, to assist people with disability and their carers with understanding eligibility and navigating access the NDIS. What is the eligibility process if the person I care for is already receiving disability funding? If the person you care for is already receiving funded disability support, they or you as their primary carer will be contacted by a NDIS representative when it is time to prepare and then plan for their future support under the NDIS. They will still need to go through an eligibility process, but this will be simpler than the process for people who are new to receiving disability supports. Preparing to transition into the NDIS is important. You may want to support the person you care for through the eligibility process. You can help them by collecting information they already have, or by reading Yooralla’s free guide to accessing the NDIS to assist you with navigating access to the NDIS. What is the eligibility process if the person I care for is not currently receiving disability funding? If the person you care for does not currently access disability services, but they (or you) think they might be eligible, then they will need to be assessed for eligibility to access the NDIS. You may be asked to help the person you care for through a detailed assessment process to provide the NDIS with information about their disability and the level of support they need if they have a permanent disability. The NDIA will work with them, or you if you are supporting this on their behalf, to confirm their eligibility for the NDIS. Once the person’s eligibility is established, they will be given a reference number that they can use when they contact the NDIA to talk about eligibility and access to supports. Yooralla has developed a free guide to accessing the NDIS, to assist people with disability and their carers with navigating access the NDIS. The National Disability Insurance Scheme (NDIS) is rolling out across Australia until 2019. Find out when the NDIS is coming.